It doesn't get nearly as much attention in Western news media as it should, but the Syrian uprising is still underway as rebels from the Free Syrian Army work to push the military regime out of the country. And the rebels here seem to be relying heavily on motorcycles as a way of transportation. Part of the problem with covering the uprising is the lack of outside media in the country, which means slightly blurry videos like the one below are some of our best resources for understanding what's going on in the hot spots. It makes the information harder to vet, but there's no obvious reason why this video isn't what it claims to be. 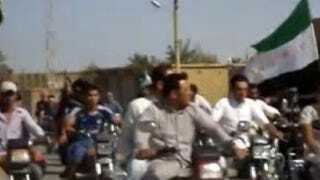 Specifically, this video purports to show an army of civilians and military defectors riding doubled-up on motorcycles through the Eastern city of Dayr al-Zawr. Whereas armed trucks (a.k.a technicals) were the choice of rebels in the relatively sparse Libya, bikes make a lot more sense in Syria. The country is 32 times as population dense as Libya, and the fighting isn't open desert warfare but block-by-block street fighting. Can anyone identify the bikes? They look largely Japanese or Chinese-made Japanese knock-offs.